A rapper has demonstrated that no one is immune to racism: even if you are Canadian, rich, and successful. Earlier this month, Drake discussed that he had been racially profiled at a recent visit to a Vancouver casino. Drake, who was born in Toronto, had been recognized initially as an actor on the teenage series “Degrassi.” He rapped a little on the show, which caught the attention of Lil’ Wayne’s Young Money Productions. From the first album he debuted, Drake has had nothing but success. In addition to being a rap artist, Drake also has a record label and a clothing label. On his most current album “Scorpion,” Drake broke the record for the most hits from one album to hit number one. He has ten, which beat a previous record set by the Beatles. Drake was visiting the Parq Casino in British Columbia. The casino has 13,000 slot machines and nearly 600 table games. Parq has two floors of gaming, restaurants, and entertainment, which is about 75,000 feet total of gaming and event space. British Columbia has had several scandals recently. There has been an ongoing money-laundering scandal with the River Rock Casino. The casino has been under investigation since the arrest of a Chinese man at the Vancouver airport with a suitcase stuffed with money. The investigation has found that millions were laundered through several casinos in the Vancouver area. Vancouver is one of the largest gambling hubs in Canada. Like the United States, gambling is supervised by the provinces/states, rather than at the federal level. Each state has a lottery or gambling commission that oversees gaming for the province. The country allows casino gambling in nearly every province except two. Horse racing and dog track racing are also legal. Sports betting, unlike that in the United States, is illegal except for parlay bets. Canada also has online gambling, including online casino games and sportsbooks. One of the largest poker games online is the Stars Group, which has more money than any other online poker group. Online sports bets and mobile betting are also allowed in Canada. While Drake was in Vancouver, he decided to stop in and gamble at Parq Casino. He was with a group of people and asked to gamble in the high-roller/VIP area. On his Instagram post, Drake said that the Parq casino profiled him. Drake stated that he was refused entry into the high-roller area because he was black. Drake stated the casino would not let him gamble. He was prohibited even though he provided paperwork proving his identity and where his large bankroll came from. The casino has argued they asked him for the same paperwork they require all other high-rollers to provide. High-rollers must provide proof of who they are, and proof of ownership of the bankroll they carry in. 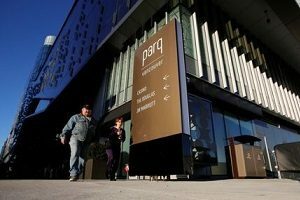 The Parq said it was investigating the incident. However, the paperwork required for high-rolling gamblers has increased since the crackdown on VIP gamblers in general in 2017. Anyone who brings more than $10,000 into the casino must have paperwork showing ownership of money. Drake said it was racial profiling. In reality, the casino may have just been going along with guidelines—although perhaps they may have worded it better.